It's EASY to get started! Create your own plan, use our editable floor plans and layouts or take pictures of an existing house and easily add design features and details. QUICKLY create kitchen, baths and landscapes with professional designer quality layouts that you can drop into your projects. NEW integrated interactive help system to make finding and using the right tool easier than ever. Includes training center video tutorials and free technical support. The Premium Series is for the serious DIY person who wants comprehensive tools and capabilities to develop home plans and design interior rooms and landscaping options. Dream it! Design it! Build It! Live it! The Easy Approach to Designing YourDream Home Designing your dream home has never been easier! Whether you arebuilding from the ground up, remodeling, or renovating, Punch! 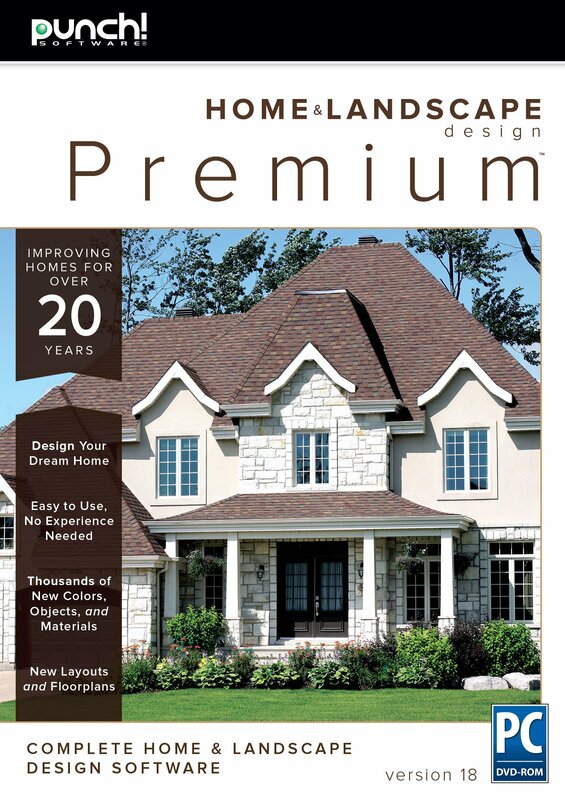 Home andLandscape Design Premium 18 will help you bring your dream home to life! It'seasy to get started with the QuickStart feature that allows you to quicklydrag and drop rooms to create your layout or use one of the editableprofessionally designed floor plans for inspiration. Utilize the extensivelibrary of brand name products, materials, furnishings and accessories tocomplete your design and then visualize your project in 2D, 3D and printprofessional plans.